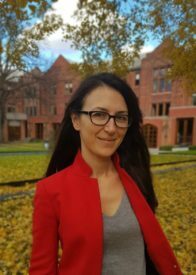 Filiz Kahraman is an Assistant Professor in Political Science at the University of Toronto. Her research investigates law and politics from international and comparative perspectives. She is currently working on a book manuscript examining why labor activists in Europe pursue human rights law as a new mobilization strategy and how international law has affected the lives of aggrieved workers on the ground. Before joining the University of Toronto, she was a Postdoctoral Fellow at the Mortara Center for International Studies at Georgetown University. Her commentary on current human rights issues and the political crisis in Europe and Turkey has appeared in The Washington Post, The Seattle Times, openDemocracy, and Bianet (in Turkish). “The European Court of Human Rights: Towards a Holistic Approach to Human Rights” in The Institutions of Human Rights: Developments and Practices. Eds. Susan Kang and Gord DiGiacomo. University of Toronto Press. (Forthcoming, 2019). “Racial Capitalism and Legal Mobilization: Contesting Hybrid Liberal and Authoritarian Legalities in Comparative Perspective.” Annual Review of Law and Social Science. Co-authored with Michael McCann. (Forthcoming 2019). “A New Era for Labor Activism? Strategic Mobilization of Human Rights against Blacklisting.” Law & Social Inquiry. (https://doi.org/10.1111/lsi.12299) (2017).